Pictured is a rendering of what the future Coughlin’s Crossing development in might look like. The rendering was unveiled on Wednesday during a meeting held at The Barn at Stratford. Pictured north of the site is U.S. Route 23, while Stratford Road is shown south of the development. 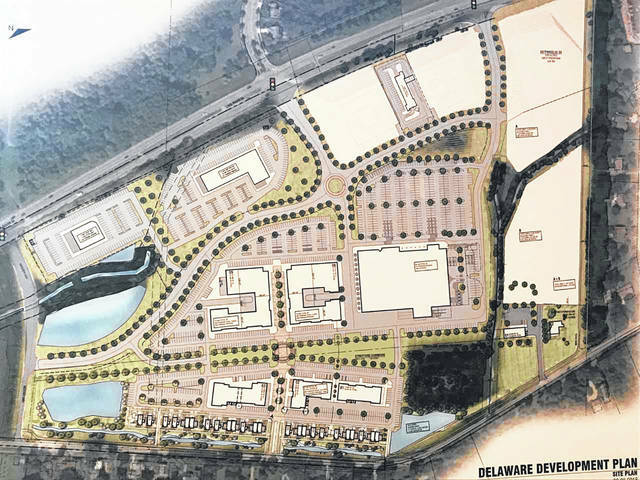 More than a year after Delaware City Council approved a final subdivision plat and a final preliminary development plan for the first phase of Coughlin’s Crossing, some shaping is finally taking place for the roughly 80 acres located between Stratford Road and U.S. Route 23, north of Meeker Way. Developer Connie Klema addressed a room full of people, many of whom live near the development, at a meeting at The Barn at Stratford on Wednesday night. In discussing the layout of the site in regard to purpose, Klema said the quad that is closest to U.S. 23 will include the main core of retail buildings. She reasoned that people want to see and know where they are going, making the “quad” most visible from U.S. 23 the ideal location for potential shops and restaurants. She also noted that area would be the furthest away from the residents along Stratford Road. Moving inward toward the center of the site, she said there will be some retail use as well, but office space will also be included. On the eastern quad of the site, Klema added there will be a mix of retail, office space, and apartments mixed in, with a line of single-family homes on the eastern edge facing Stratford Road. A spine road is being constructed to provide interior access to all “quads” from Meeker Way. Klema said she expects the entrance from Meeker Way to be the primary entrance to the site because of that access. Because she expects the entrance to see the most traffic, Klema said she wants the entrance to feel like “you’re driving into a town.” Retaining ponds with fountains will exist on each side of the entrance. Additional entrances will be across from Hawthorne Boulevard and the Kroger on U.S. 23. In the past, there were discussions about the potential for a box store that would be the main tenant of a commercial building spanning nearly 100,000 square feet near the center of the site. Klema had said previously she hoped to attract a grocery store as that tenant. Asked about where that might stand, Klema said there are still discussions with Kroger, but she also shared a different vision after working with city staff: a building similar to North Market in Columbus that would include various types of local vendors. North Market offers anything from farmers’ markets to fresh seafood and restaurants. Klema said she will be meeting with the director of North Market this week to discuss the feasibility of doing something similar at Coughlin’s Crossing. However, she prefaced her thoughts by saying it was simply a “dream” of hers at this point and far from coming to fruition. She also noted a Blue Sky Car Wash will be one of the first businesses to come into Coughlin’s Crossing. It will be built on the northern part of the retail stretch along U.S. 23.